Poetry. Edited by Daniel Lawless. PLUME POETRY 7 comprises the very best new poems from a curated roster of renowned and emerging poets, hailing from the U.S. and abroad. Its contents have been labeled "eclectic" and "with no literary axe to grind." Here you find under one roof a host of disparate poetries, from those of Pulitzer Prize winners Rae Armantrout and Stephen Dunn, to Kingsley Tufts Poetry Prize recipients Patrica Smith and this volume's Featured Poet Angie Estes; from Billy Collins to Lydia Davis, Afaa Weaver to Kwame Dawes, Simon Armitage to Hisa Yu. But perhaps Bruce Smith says it best: "PLUME POETRY 7 offers a counter-voice to the dominant discourses of our age, a blessed alternative to broadcasts, and information, and 'intelligence.' There is virtuoso discernment and commitment and a discriminate sympathy at work in the assembly of these poets that remind us of our multiplicity, our endurance, our soul." No wonder, then, that in its seventh year, the anthology has risen to the ranks of the Best American Poetry series and increasingly finds a home in some of the nation's finest university classrooms, where by all accounts students and their instructors are perusing and using its poems to discover their own voices and, in the case of the latter, exciting new ways to guide them in that journey. 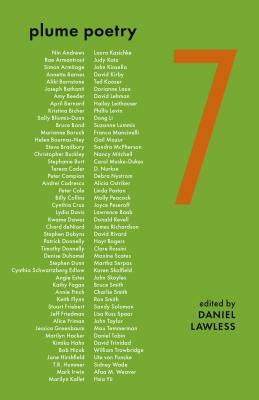 Contributors: Nin Andrews, Rae Armantrout, Simon Armitage, Christopher Buckley, Billy Collins, Cynthia Cruz, Lydia Davis, Kwame Dawes, Stephen Dunn, Marilyn Hacker, Kimiko Hahn, Bob Hicok, Jane Hirshfield, T.R. Hummer, Mark Irwin, Ted Kooser, Dorianne Laux, David Lehman, D. Nurkse, Debra Nystrom, Donald Revell, Clare Rossini, Maxine Scates, Ron Smith, Sandy Solomon, Lisa Russ Spaar, John Taylor (translator), Max Temmerman, Ute von Funcke, Sidney Wade, Afaa M. Weaver, and many more.